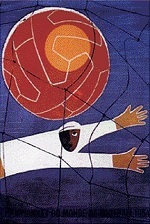 The 1954 FIFA World Cup, the fifth staging of the World Cup, was held in Switzerland from 16 June to 4 July. Switzerland were chosen unopposed as hosts to hold the 1951 World Cup Finals, at the 24th FIFA Congress in Luxembourg on 26 July 1946 (along with the 1950 World Cup). A day later, Congress decided to delay the World Cup Finals for three years, deciding it should take place in 1954. These Finals used a unique format. The sixteen qualifying teams were again divided into four groups of four at the draw in Zürich, 30 November 1953. But each group contained two seeded and two unseeded teams. Only four matches were scheduled for each group, with a seeded team versus an unseeded team. Extra time would then be played if the teams were level after ninety minutes, but a draw would result if the scores were still level after 120 minutes. The fixtures were drawn up on 1 February 1954. Because it had yet to be decided whether England or Scotland would win their group, both teams were paired with each other's opponents. 16 November 1953: The World Cup Organising Committee decide that no injured player can be replaced during the World Cup Finals. 1 February 1954: The following fixture list is made for Wednesday, 16 June - Austria vs. England or Wales or Scotland in Zurich. Thursday, 17 June - Belgium vs. England or Scotland in Basle. Saturday, 19 June - Uruguay vs. England or Scotland or Wales in Basle. Sunday, 20 June - Switzerland vs. England or Scotland in Berne. 7 April: The FA selectors nominate 32 players for the World Cup, that will at first be tested on the continental tour in May. 22 April: As one drops out, another nine players are added to the party to make forty players. 24 May: The England party return from their disastrous continental tour, losing both matches (1-0 to Yugoslavia and 7-1 to Hungary). 1 June: England party began two days of training at Roehampton, prior to the announcement of the World Cup squad. 3 June: The Football Association announced the squad of 17 players that were to travel to Switzerland for the tournament. 8 June: The Football Association announced the five reserves, who were to remain at home on standby. All of the 22-man squad returned to Roehampton for a further three days of training. Matthews and Finney were given the third day off. They were all asked to train on their club grounds for the next two days. 11 June: England's team for the opening game, against Belgium, was announced. 14 June: The England squad arrived in Lucerne, their base for the tournament. "England...were like those rare children of light who can pass through any experience protected by a sheath of impenetrable innocence. "...dominated the central hour with some pure cultured football to take a lead that should have given them a worthy victory. "England, in a world sense, represent a Third Division side that has found its way into the last eight of the FA Cup. "...must start thinking intelligently ahead of the pass. "Yet England...deserved to win a match of extreme mediocrity. Another feature of the 1954 format was that the four group-winning teams were drawn against each other in the knockout stages to provide one finalist, and the four runners-up played against each other to provide the second finalist. The draw took place on 21 June. "...England so nearly could have won. "...Uruguayan defence began to shudder before an articulate English answer made pointed by the inspiration of the evergreen Matthews. "...higher degree of mobility, imagination, accuracy, and spirit than one has seen from an English side for some time.